I don't know man, somehow I did it. I think you have the pipes a little off. These things were made for our cars. Unless Styluss changed something, which I don't think he did. Well just try to make some adjustments and see if you can get it to fit. Unless Styluss changed something, which I don't think he did. Mine is a original tranzgenic intake ... But styluss intakes are the same thing . LOL so was mine(on the 90GT). I have a Styluss one on the 95. Looks like you have it in the same place as the photo. Mine was more to the left. I wanted more metal to support the prop rod. I think it was over about 4in's from the rod mount. The car is long gone and I have no photos of it. If I remember right the tube was touching or close to the battery. If you move the tubes around you should be able to point it the other way. I have often thought of adding a second piece of tubing so the filter sits closer to the large opening in the front of the bumper. Check eBay for "Intake heat shield" or something of the sort. They are like $15 and they are awesome for this sort of thing. 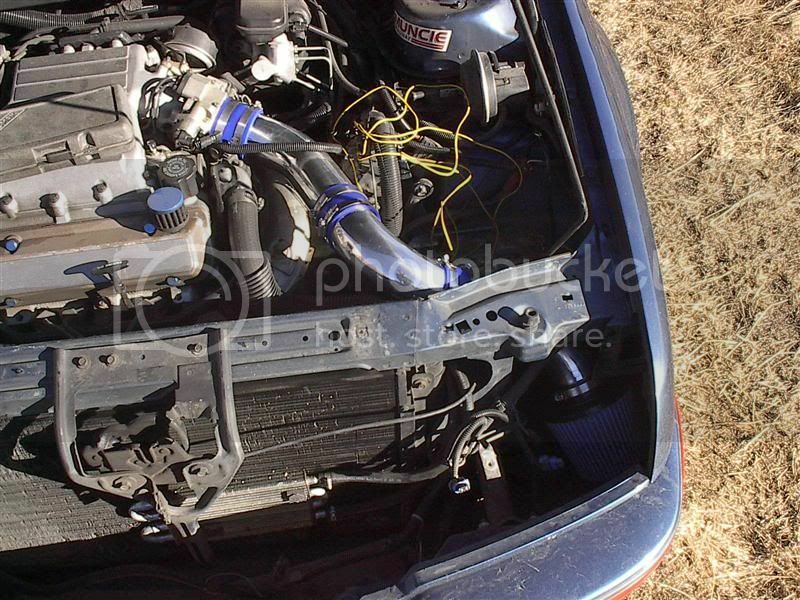 Oh, and I have never changed a thing about this intake from the Tranzgenic design. Double true. I'm going to take a look at where my filter sits tonight. I believe that it sits right where yours does, but I never have water issues. Wow I screwed up and it came out for the better for once? The filter was a RX-4990. It's easy to see how it helps the air flow into the tube.